The magnificent Winchester Cathedral. It watched the pilgrims start The Pilgrims Way to Canterbury nearby. It is the burial place of several kings, The Saxons, Egbert of Wessex, the well known King Canute, plus of course the original burial place of King Alfred the Great and his son Edward the Elder. 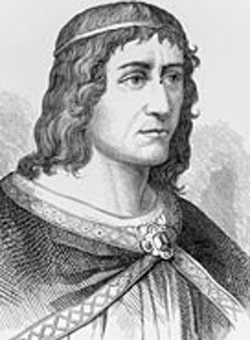 Also the Norman King William II, referred to sometimes as William Rufus. Queen Mary I was married to Philip of Spain in Winchester Cathedral on 25th July 1554. Winchester Cathedral © Copyright Colin Babb and licensed for reuse under this Creative Commons Licence. 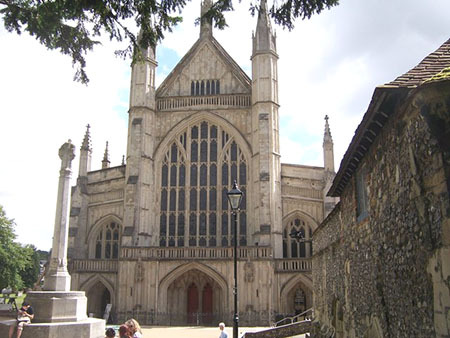 Winchester Cathedral is of Norman construction started in 1079 by Bishop Walkelin. 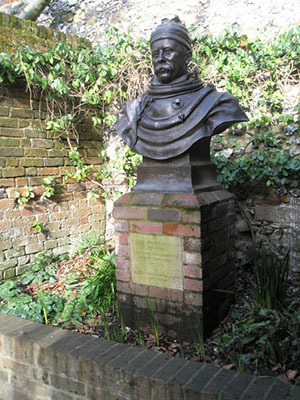 He was the first Norman Bishop of Winchester and related to William the Conqueror. Building continued for centuries, William Wykeham is responsible for the building we see today. But it is on unstable ground and urgent restoration work was carried out between 1905 and 1912. Thanks to William Walker, the diver, the cathedral was saved. The crypt can still flood however. This was not the first cathedral, there were Saxon ones just to the north from the year 642, the second one was demolished in 1093. Between them these cathedrals have been witness to the history of England, Winchester for many years being its capital and even for several centuries afterwards an important city, and even now the county town of Hampshire. Perhaps there was a sacred place in or near before the first of the Cathedrals. The sacred well in the crypt suggests this. Maybe Roman, maybe Celtic. More likely to be Celtic than Roman, or the Romans took over a Celtic well. It may be even earlier. It is not known. These wells were often places of healing or were mystic in ambience. Wessex abounds with mystic habitats both stone and water. Their origins go back into the mists of time. Venerated places rich in both historical and haunting spirituality. Christianity took over many of these wells. Sometimes a saint was said to be connected with them. There are stories that the first Minster was built in the 2nd century, but these are not true. Sometimes there is a grain of truth in old legends and maybe, just maybe, this story is another that perhaps suggest an old sacred site. Romantic nonsense – maybe – maybe not! It was the Saxon King Cynegils who brought Christianity to Wessex in 648. It was his son, Cenwealh who built the first Minster, known later at the old Minster, and dedicated to St Peter and St Paul. There is also some thought that it was originally dedicated to St. Amphibalus, but this seems to be unproven. 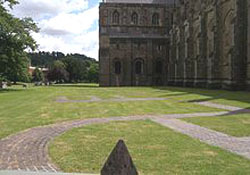 Site of Winchester Minster next to the Cathedral. Where it was has been outlined in red brick. It was a stone building, unlike the wooden structures normally built at that time. Probably the first stone building since the Roman era. Two main rooms with square side chapels. In all about 72ft long. Would have been dominant among the wooden Saxon buildings. During the 700's the eastern end was given an apse and then a tower on the western end. Because Winchester was so important around 660 it became a cathedral. The Danes were invading in the 800's and the Minster was damaged. It was repaired and became St Swithun's, for a while a Benedictine priory. A Minster was also a monastery or 'gathering of the clergy' in Saxon times, it still retained its original status. St Swithun became the patron saint. He had a reputation for restoring churches and he restored this one as a Minster and was appointed Bishop. There is a saying that if it rains on St Swithun's Day, 15th July, then it will rain for forty days. Keep an eye on the date – in these days of drought perhaps it should! When he died in the year 862, St Swithun asked to be buried outside where he still would have the rain and sun. He was, but nine years later the clergy at the Cathedral wanted to move him back into the shrine they had built for him inside the cathedral. It rained of course and the legend was born. His shrine survived the building of the current Winchester Cathedral but Henry VIII caused a lot of damage during the Dissolution and it was his commissioners who smashed the shrine to St Swithun in 1538, taking the valuables of course. It left a hole, a Holy Hole, it was called, that was filled up eventually. It was St Swithun who accompanied King Alfred to Rome when he was a boy. 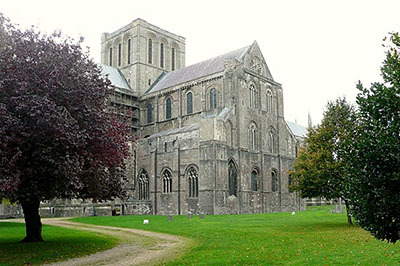 When Alfred became King of Wessex and made Winchester his capital, it was decided to build a New Minster to the north of the Old Minster. Alfred died before it was completed in 901 during the son of King Alfred, Edward The Elder's reign. This Minster remained until 1093 when the new cathedral was finished. With the Norman Conquest came Bishop Walkelin replacing the Saxon Bishop, Stigand, in 1070. Related to William the Conquerer, Walkelin was a powerful figure, he wanted more than a Minster for his status. He wanted what he was used to seeing, a fine stone Cathedral. The latest cutting edge technology! It is said the crypt was started first. However by 1100 the tower must have been built because William Rufus was buried under it. The tower fell c1107, due it was said to the wickedness of the bones of the king! Probably more likely to be poor construction of the tower, tricky things to build on wet ground! They started again about 1108. Building continued through the centuries. 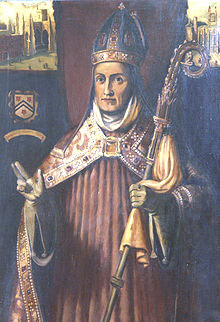 The cathedral as we see it today can be put down to two later Bishops – William of Wykeham and to a lesser extent his successor Cardinal Bishop Henry Beaufort, half brother to the King. In 1554 Winchester was in a flurry for Queen Mary I and King Philip of Spain were married in Winchester Cathedral in a lavish ceremony. Several Chantry chapels where masses were said for whom the chapels were built, are in various parts of Winchester cathedral and we can see them today. Among them are the chapels for the powerful Henry Beaufort, half brother to Henry VI, William of Wykeham whose motto was “Manners Maketh Man” and responsible for much of the modern cathedral, and Stephen Gardiner who married Queen Mary I and Philip of Spain. All Bishops of Winchester. Henry VIII destroyed a great deal of Church heritage, but apart from a lot of damage, Winchester Cathedral survived and was rededicated by the King to The Sacred and Undivided Trinity. Nowadays it is known as dedicated to The Holy Trinity, St Peter, St Paul and St Swithun bringing together its incredible history over the ages. That west window looks like abstract art It was not always like that, During the Civil War Roundhead soldiers smashed it. Locals put it back together again, but they did not know where the pieces went resulting in today's rather charming window. Winchester Cathedral has many treasures but probably the most important and the most famous is the 12th century Bible. It is said to be "largest and finest of all surviving 12th-century English bibles." It is normally on show in the Cathedral Library. 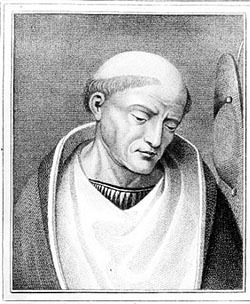 It was Henry of Blois, then Bishop of Winchester, who came up with the idea c1160. A new grand Cathedral deserved a beautiful grand Bible. 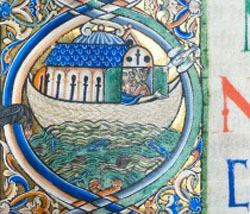 Illustration of Noah's Ark from the Winchester Bible. Such beautiful detail, so small and delicate. It is beautiful to see with all its colour in its capitals and the little pictures. Apparently a single scribe wrote it out in Latin, must have been a labour of love for years but it is apparently unfinished. One wonders what happened to this devoted scribe, why did he not finish it, perhaps he died and no one else was clever enough to take it over or could not bring themselves to do so. The scribe did not paint the pictures, and those big initial letters they were painted by six artists. Those colours have lasted for centuries and for that we have to thank those people who decided on using only the finest pigments. Only the finest calf parchment was used, also pretty expensive. There is some acknowledgement of that expense by the fact that space is being saved all the time. We shorten words when we are texting to save space and time for that matter. So did our scribe shorten words to save space. By using that fine parchment the Bible has survived the centuries. Our scribe used a goose quill to write with. They were the best and he could form his letters with skill and ease. The Bible has been cared for over the centuries, but even so thieves have been at work taking parts of it. Sad. It is now bound in four volumes, but was originally two. Pretty heavy! Archaeologists have found evidence of a 12th century bell casting pit under the Old Minster. The modern Cathedral has 16 bells from 1621 onwards. there were seven by 1632. The bells hang from an oak frame made by John Williams c1734. To hold those heavy bells the frame had to be very sturdy indeed and so it is - massive! The current organ has been played there for the last 150 years. Unique and rather special actually. It was in the great 1851 Great Exhibition at Crystal Palace, the largest and best organ there. 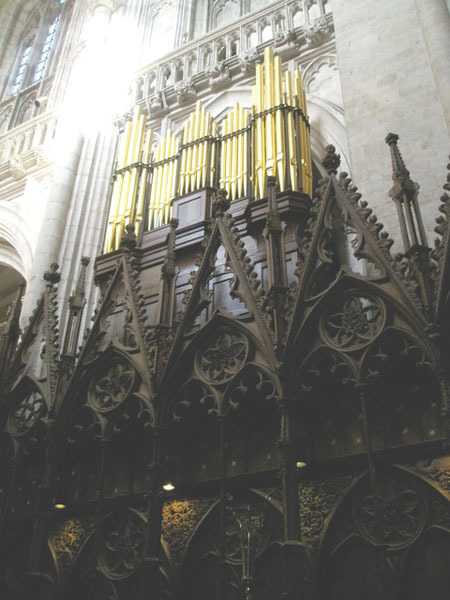 The organist of Winchester Cathedral, S S Wesley saw it, loved it, and recommended the Cathedral bought it. They had it altered to fit in the space and by 1854 it was installed. Modified several times since. Now has 5,500 pipes. It is a beautiful organ to look at and its music is just wonderful to hear. Majestic. The Cathedral organ and the Choirs make incredible music. The current one is of course not the first. There was an organ recorded in the 10th century which means it was in the Old Minster. It is probable that new ones were built into both the New Minster and the Norman Cathedral. The Cathedral most likely has had more than one during the centuries. Winchester cathedral was in fact built on unstable ground and that heavy stone structure eventually started to fail, albeit after centuries. The southern and eastern sides of the cathedral were sinking and in water. Enter the diver, the famous William Walker. Experienced he might have been but what a job to be faced with. It took him five years, 1906 to 1911, in a diving suit to shore up the cathedral. An incredible feat for which the cathedral today completely owes its existence. Winchester Cathedral in modern times represents the grandeur and traditions of the past while still being a living, breathing Cathedral. It welcomes 300,000 visitors a year to services, tours and special events. Those special events range from markets to flower shows though poetry festivals to exhibitions. Keep an eye on the Winchester Cathedral webpages and Events in Hampshire on this site. Its music from its magnificent organ to the wonderful choirs, fill the cathedral with splendid sound.